peter salerno inc – Design Your Lifestyle. April 2019 April 2019 Peter Salerno, Inc.
Current kitchen design focuses on clean, fresh colors, a healthy dose of light, and a sense of ‘open space’ – even in tight quarters. How do today’s best designers maximize the space available in each new kitchen, and make even small kitchens seem larger than the space they occupy? For many, glass cabinetry is the answer. Simple glass panels on the front of kitchen cabinets allow for greater, more varied applications of light, as well as ‘open up’ the design space. Glass cabinets can feature beautiful dishware, stemware and accessories, as well as provide a needed ‘break’ for the eye in a stretch of closed-off cabinet space. Glass cabinetry helps your kitchen design feel fresh, open and bright. Used in intelligent doses, glass provides wonderful reflection of ambient light sources, as well as the opportunity to add more light to your kitchen design. Glass panels open up the front of your cabinets, allowing interior and recessed lighting within the cabinets themselves to radiate out into the kitchen design space. The result is a brighter kitchen without going overboard on accent lighting and island lighting (or using an overbearing quantity of high hats). In the white transitional kitchen pictured below, placing glass cabinets both adjacent to the large window features and the far design wall allows natural light to reflect beautifully throughout the space, allowing the large kitchen to be well-lit with a minimal amount of ceiling fixtures. Glass cabinets can also create an elegant effect, like the ones seen below in Peter Salerno Inc.’s award-winning showroom in Wyckoff, New Jersey. The glass cabinetry features gorgeous blue plates and glassware to match the La Cornue range, rotisserie and chandeliers. Recessed lighting within the cabinets adds a luxurious glow to the kitchen, and mirrors the accent lighting inside the recessed Swarovski crystal ceiling feature. Glass cabinetry in the La Cornue feature of Peter Salerno Inc.’s showroom. The addition of glass cabinet faces helps open up the walls in the transitional design below. High-hat recessed lighting is placed around the ceiling’s perimeter to utilize these glass surfaces in carrying their light around the kitchen space. These tall, vertical glass cabinets help elongate the room, and provide pleasant breaks of the flat gray wall spaces for the eye to enjoy. The transparent cabinets also play nicely against the reclaimed tin on the recessed ceiling and the twin refrigerator doors. This Jupiter, FL kitchen utilizes glass cabinets to open the design space. Glass cabinetry also helps add depth to more ornate kitchen designs (like the one seen below). The mirrored ceiling only augments the traditional curved cabinetry on either side of the range, with recessed cabinet lighting to highlight the gorgeous dishware stored inside. The additional depth created by the glass cabinetry blends seamlessly with the twin archways into the dining room and hall on either side of the kitchen, helping add perceived length to the space. Peter Salerno Inc.’s award-winning kitchen design. Photo credit Peter Rymwid. Making the simple choice to use glass on your kitchen cabinets reaps tremendous benefits. It allows the owner to display dish and stemware, while adding additional light to the design space through the use of recessed cabinet lighting. It reflects both ambient light and lighting fixtures, adding a layer of brightness to the entire kitchen. Glass cabinetry also provides a ‘break’ for the eye along a flat design wall, as well as a point of focus to break up long rows of closed-off cabinetry. What’s your take on glass cabinetry? Do you utilize it in your designs? Is it an idea you’re playing with for your next kitchen design or renovation? We’d love to hear from you in the comments! Instagram has become THE must-watch social media platform for designers and design enthusiasts. Kitchen design inspiration is everywhere on Instagram – but which posts are “on trend”, and which are simply filler content? Here are 5 kitchen design trends we’ve identified in recent Instagram posts (courtesy of Peter Salerno Inc.’s Instagram account) that we think you NEED to watch. Chevron tile is starting to make a challenge to classic subway tile in today’s trending kitchen backsplash designs. If you’re going with a chevron pattern, take the extra step of using bold, eye-catching materials. The use of turquoise as a feature design material in the chevron tile pattern below turns a yawner into a real winner! 2. Quartz and Quartzite… as Kitchen Islands! Yes, quartz is a true contender to the marble throne when it comes to kitchen countertops… but who knew it could be utilized as the main material for a kitchen island base? This quartz island base features cabinet cutouts and a simple white countertop, drawing attention to the island itself rather than the top. This is a bold choice that we love (and that we’re following closely)! This proposed sink basin (from Peter Salerno Inc.) is a jaw-dropping statement piece. Much like the quartz island base above, the real trend here is making statements with the often ‘forgotten’ elements in your kitchen or bath design. Instead of focusing all your effort on the counter, the backsplash, or other ‘expected’ design areas, why not stand apart from the crowd by featuring a unique design piece like this sink? A simple vanity and having this as the powder room sink? | This would be dynamite 🧨! If your design consultant or design team aren’t offering high-quality 3-D renderings of their design proposals, you simply aren’t getting the experience you deserve from today’s design industry. Custom 3-D renderings of your future kitchen design have gone from ‘luxury’ to ‘necessity’, and you owe it to yourself to see your design space as a finished product before work in your home even begins. The geometric square pattern on the back of these chairs allow the designer to weave the kitchen’s overall theme through its island counter seating. The ability to continue patterns and themes through kitchen seating helps tie in the overall design aesthetic and keep your kitchen cohesive. This spring, why not dare to add a little spice to your home design? If you’re looking for ‘permission’ to heat up your home’s color palette, look no further than Pantone, the world’s foremost authority on color intelligence. The Pantone Spring 2019 color collection is the most audacious Spring palette in years. Led by Living Coral – the 2019 Pantone Color of the Year – the warm tones in the Spring 2019 collection are approachable, festive and begging to be utilized in your designs. It’s much simpler to lean on the neutrals, blues and greens in the Spring 2019 Pantone collection for design purposes; sometimes, the simple choice is the proper one for your home. But if you’re feeling a little spicy, there are definitely ways to incorporate some of the hotter tones of Spring 2019 into your kitchen, bath and home decor. Here’s a look at four of our favorite warm tones from the Pantone Spring 2019 color collection, and how you can utilize them to add a ‘kick’ to your home design! The Pantone 2019 Color of the Year didn’t get that honor by accident. Living Coral is far more complementary than it appears, with its upbeat vibe and natural underwater presence. Living Coral pairs beautifully with most light neutrals, a nice variety of blues, and (sparingly) with other red tones. Living Coral (Pantone 16-1546) provides a great punch of color without overwhelming the senses. Try it on accent walls, in tile, stemware and dishware, and virtually any decor. This especially holds true if you’re looking for a fresh new splash for a beach home, condo or house in a warmer climate. A bit ‘safer’ than some of the other Pantone Spring 2019 warm tones, Aspen Gold is a warm color with a lot of versatility. An eye-catching shade of yellow, Aspen Gold blends beautifully with off-white, cream, taupe and brown neutrals – perfect for those of you looking to take advantage of trends like neutral-based kitchen designs and exposed vintage wood beams. If you want to warm up your home design but don’t feel like taking a plunge into extremely bold territory, Aspen Gold is a smart choice. Fiesta may be too hot for some, but those with a deft color design touch can hit a home run with this punchy red. We’re not sure if you want to ‘lead’ with Fiesta, but it can make a spicy dance partner as a complementary shade in neutrally-dominated color schemes. If your kitchen, bath or living space is too ‘flat’ (maybe you’ve gone TOO neutral with your color choices thus far? ), then Fiesta can pack a massive punch in minimal doses. You don’t need to do a lot with Fiesta; apply sparingly, and let one of the hottest colors of Spring 2019 do the talking. If you’re looking for a tangy color to start an immediate conversation, Mango Mojito might be the one for you. You’ll want to think outside the box with this orange tone – if all you’re going to do is use Mango Mojito in throws, pillows and other predictable accessories, why bother? If you’re going to “go Mango”, you might as well go for broke! Be imaginative, and come up with a fan way that Mango Mojito can work for you! Can you incorporate it into your bath tile, backsplash or floor tile? Is it a spicy choice for the base of your kitchen island? Perhaps you’ll give your dinner dishware a ‘southwest flair’. The possibilities – if approached intelligently – can reap a massive design reward. We want to hear from YOU! Which warm tone from the Pantone Spring 2019 color collection is YOUR choice as a home design star? Leave a comment! Is Blue the Breakout Kitchen Design Color of 2019? Getting the blues might be exactly what your kitchen needs in 2019. 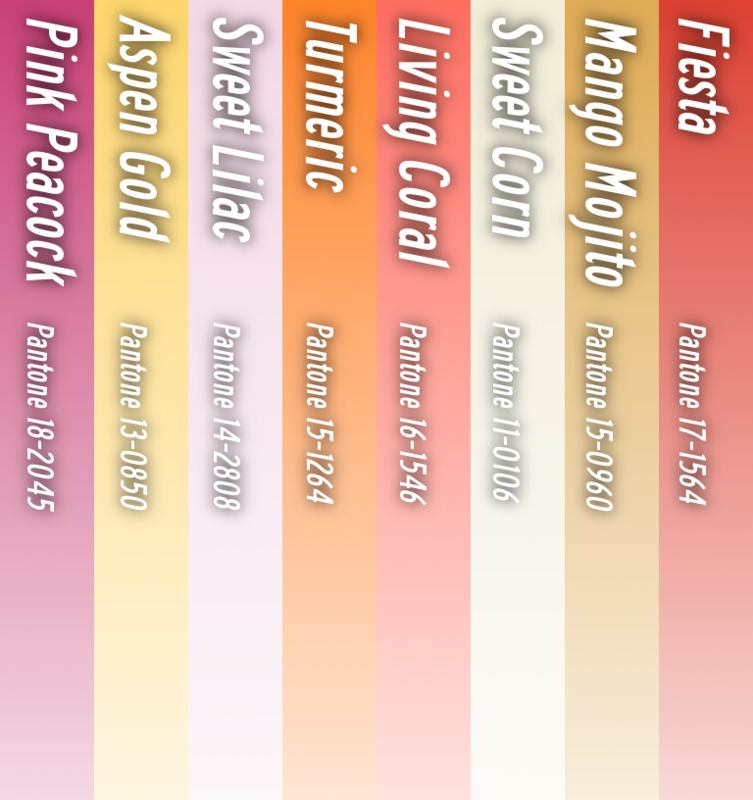 Pantone’s Spring 2019 color palette featured bold tones like Living Coral (the 2019 Color of the Year) and Mango Madness, coupled with trendy neutrals like Sweet Corn and Toffee. But Princess Blue seems primed to emerge from the pack as a go-to kitchen design color in 2019, thanks to its versatility, rich ‘pop’ of oceanic blue, and the luxurious nature of its sapphire jewel tone. When award-winning design firms like Peter Salerno Inc. proclaim, “Blue is becoming our dominant color this Spring with our current design jobs” (via Instagram), it’s hard not to take notice. Navy blues have taken the lead in past design seasons, but a rich royal like Princess Blue brings a different vibe to the (kitchen) table altogether. Will Princess Blue become the breakout Pantone color of 2019? As 2019 kitchen design photography emerges, it’s evident royal blue tones are beginning to weave a thread through much of this year’s great design. Blue is a savvy, sophisticated choice for a rich color that blends well with virtually any neutral. The 2019 Peter Salerno Inc. kitchen design featured in the photo below (and in this article) uses Princess Blue in its stemware, dishware and other accessories. This splash of color balances four different neutral tones in the design scheme – white, flat gray, brushed silver (on the appliances), and the light brown of the reclaimed vintage ceiling beams. Peter Salerno Inc.’s reclaimed wood beams in transitional kitchen design with pops of rich Princess Blue, 2019. Blue isn’t just making a statement in ‘royal’ varieties in 2019. The brilliant kitchen island featured below exhibits a lighter blue reminiscent of Little Boy Blue from the Pantone Spring 2018 collection. 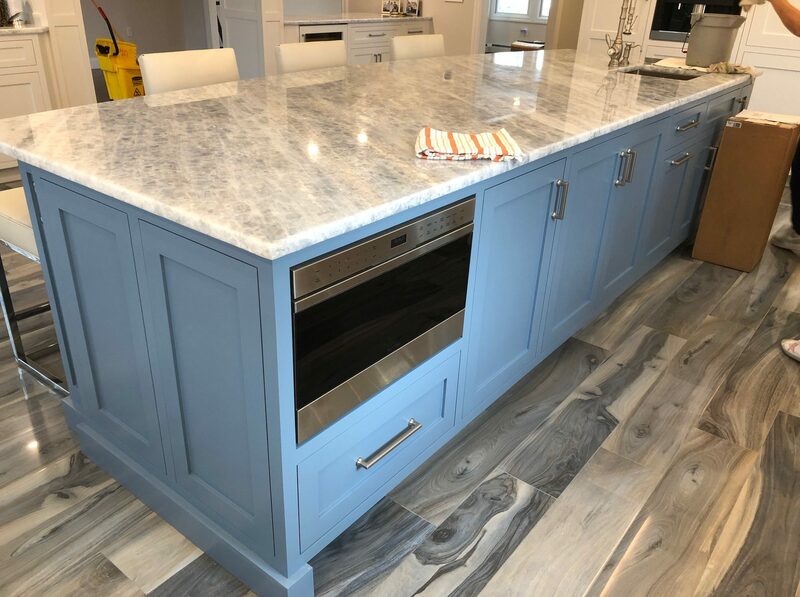 As in the kitchen design above, this eye-catching blue tone pulls together a transitional kitchen full of white and gray grained surfaces – both the faux wood grain flooring and the beautiful island countertop. 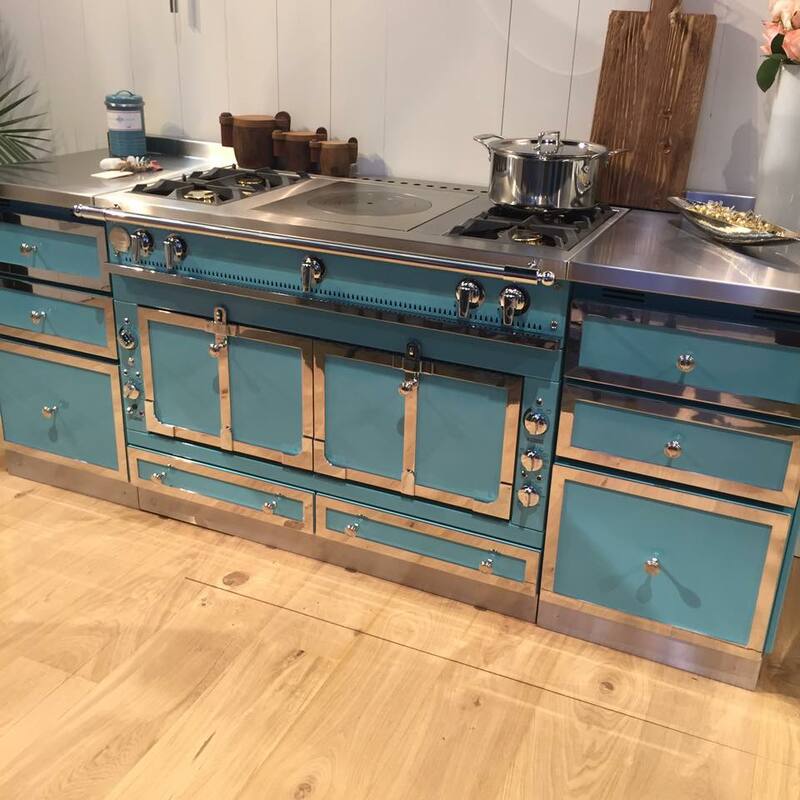 Even world-class appliance craftsmen like La Cornue are featuring shades of blue in their designs. The stunning Grand Palais La Cornue piece featured below dazzled attendees at a recent KBIS conference. 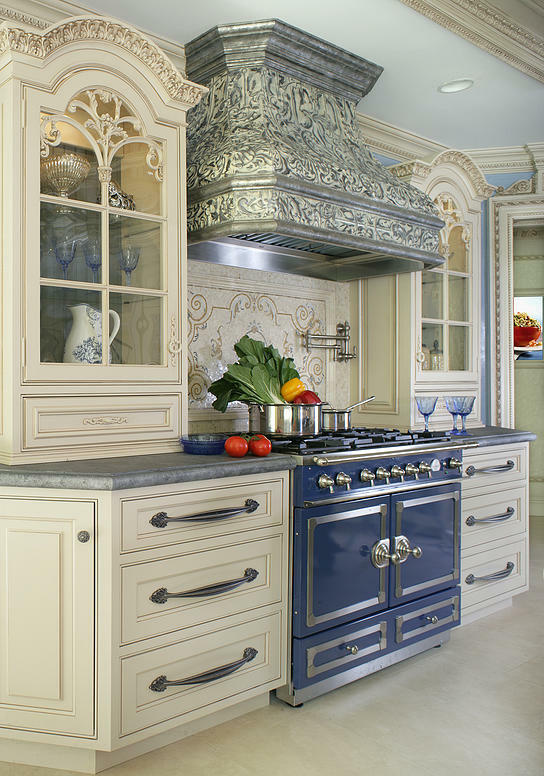 A more royal shade of blue applies to the La Cornue range at the very bottom of this piece; the French Blue La Cornue range in that Peter Salerno Inc. kitchen design pulls central focus in an ornate kitchen, sitting neatly below a unique reclaimed tin custom range hood. The stunning blue La Cornue display range at the KBIS 2017 Conference. Magazine spreads are featuring more and more blue kitchen designs as well. Bergen Magazine’s recent feature of this blue-based transitional kitchen design turned heads with its variety of blue shades tying together a neutral kitchen. From a light blue feature wall to classic Dutch blue-and-white ceramics, dark blue-and-white kitchen chairs to an undertone of blue in the smoked glass on the refrigerator, this kitchen design proves that blue can dominate the conversation without overwhelming the senses. 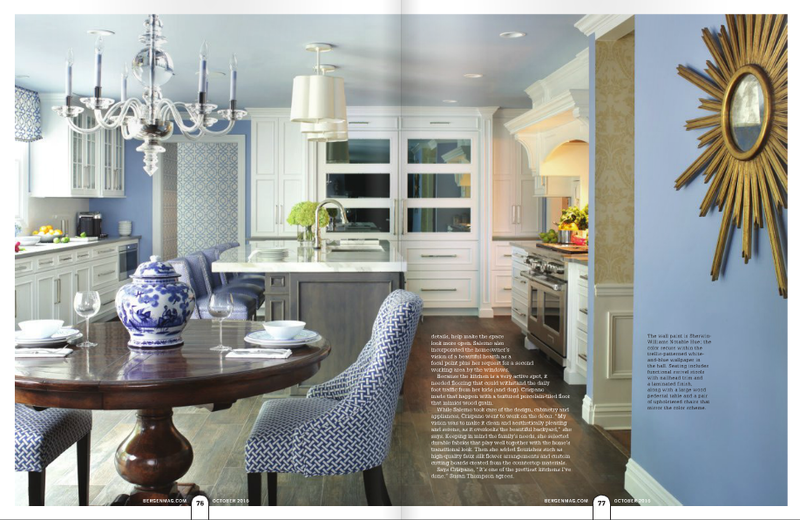 Bergen Magazine, featuring Peter Salerno Inc. blue transitional kitchen design photos. But what’s YOUR take on kitchen design colors in 2019? Is blue the breakout star of the year, or is another color poised to dominate the kitchen design landscape? We’d love to hear from you in the comments section below! Light is everywhere. How we use it defines our space, our perception and our outlook. In today’s finest kitchen designs, light is more than a tool to illuminate beautiful decor. It’s part of the design itself. Smart kitchen design experts understand that properly using light – both ambient and fixed – is a key to providing a truly luxurious kitchen space. Smart kitchen lighting design can accent desired features of the space, draw focus to seating, highlight cabinetry and reflect beautifully off brushed metallic and glass surfaces. In the following photos, we’ve highlighted how Peter Salerno Inc. has used statement lighting in recent kitchen designs to create dramatic, highly desirable results. Which do you like best, and why? 1. Bold, rectangular statement lighting accents a clean, transitional kitchen island as well as the vintage wood beams in the ceiling design. Peter Salerno Inc.’s reclaimed wood beams in transitional kitchen design, 2019. 2. Utilize the same material (and finishes) in your statement lighting to match other kitchen design pieces, like your custom range hood. Stunning new kitchen design photos from Peter Salerno Inc.
3. Opulent lighting fixtures pair with recessed ceiling and counter light to create a luxurious glow. 4. A series of small, glass-covered island lights spread light throughout this Moscow kitchen design. A custom RangeCraft range hood dazzles in this Moscow kitchen design by Peter Salerno Inc.
5. These incredible pendant island lights evoke the imagery of mason jars, and create a warm, comfortable glow in this transitional kitchen. 6. Two large, brushed statement pieces with opaque filters help diffuse electric light, allowing the copious ambient light from outdoors to flow freely in this design. 7. This kitchen design opts for long, thin island lights to create a more ‘vertical’ design feel. 8. A classic chandelier piece is a central focus of a glamorous ceiling fixture that features a series of hi-hats; opulent sconces are added to match the chandelier. More beautiful design photography from Peter Salerno Inc. and Peter Rymwid. How do YOU use statement lighting pieces in your kitchen design to heighten its effect, its charm and its brilliance? Let us know in the comments! Throw the bath design rule book out the window. When it comes down to it, the only true ‘rule’ of design is creating something you love. When Peter Salerno created the award-winning, updated Peter Salerno Inc. showroom, he wanted to reserve one space that went entirely outside the box. When Peter saw the masterful graffiti-style street art that would soon adorn his showroom bath design, he knew he’d found his muse. Peter Salerno hired a professional graffiti artist to create a bold, vibrant cityscape in the bathroom design. From a replica manhole cover in the center of the floor to colorful depictions of a metropolitan skyline and an elevated subway line, the artwork is audacious and vivid. The inside of the bathroom door is even “tagged” with notable initials, names and dates important to Peter Salerno, his family, and the Peter Salerno Inc. legacy. Now, before anyone panics – design conventions and standards exist for a reason. There’s no reason to abandon ship on everything you know about design. However – as with anything else – sometimes stepping outside one’s comfort zone is the only way to reach new heights as an artist, a designer and a creator. As with many of the designs we feature, the true beauty of this graffiti art bath design is in its personalization. As the years have passed at the Peter Salerno Inc. showroom, the ‘tags’ on the bathroom door have filled in – with new staff members, new husbands and wives, children and grandchildren. A simple door has become a living testimonial to the Peter Salerno Inc. design family as well as Peter’s own family. It’s important to respect your personal legacy and style while incorporating new elements into your home design, especially in frequently traveled areas like the kitchen and bath. Rich colors can still be comfortable and inviting when coupled with design elements that mean something to you. By stepping outside a personal comfort zone, a world-class designer was able to pay tribute to his family, his design team, and a city which he loves. How do YOU plan to step outside your ‘design comfort zone’ and grow? Let us know in the comments below! For more about the graffiti bath design at Peter Salerno Inc.’s award-winning Wyckoff, New Jersey showroom, check out Peter Salerno Inc.’s official Instagram account. Read more about this design on the Peter Salerno Inc. Instagram account.